A lot of houses (and office buildings and shopping malls… ) opt for strictly neutral colours these days. And although there is nothing wrong with that (neutral tones do lend a certain elegance to a structure), we can’t help but miss the good old days when vibrant tones were all the rage. 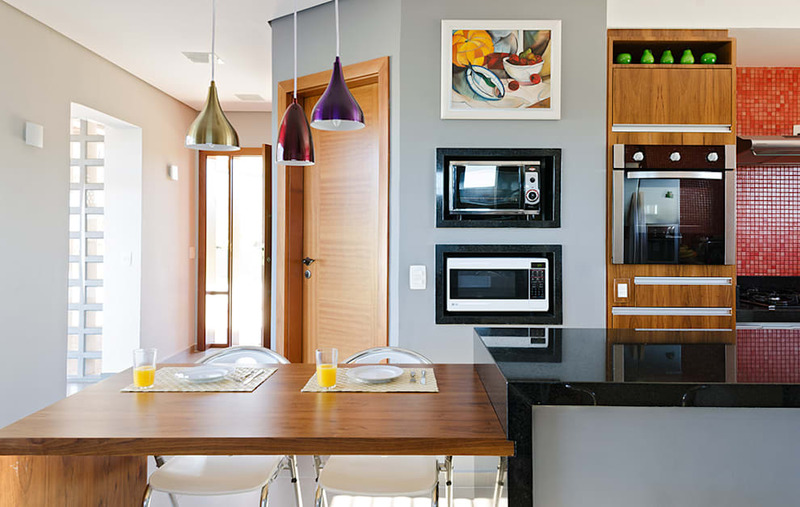 It would seem that a certain rustic villa in Brazil felt the same, for it treats us to a grace of vibrant colours (not too much, though) to conjure up inspiring and tasteful interiors. Add to that some high ceilings, sundrenched interiors, and sleek versions of country-style furniture, and we have a home that ticks off just about every requirement on our dream home wish list. It’s a very laid-back yet stylish greeting that the front facade gives us upon our first meeting. Slightly slanted terracotta roof tops add a rich and warm vibe to the earthy tones of the house’s exterior surfaces, while delightful patterns of brick, wood, and lush plants present an elegant yet homely feel to the entire property. Fortunately this house didn’t use up all its charm at the front, for the rear side also makes our jaws drop. With a neat little stone path leading up to a wooden deck, the hot-spot for relaxation is shaded most stylishly by a slanted roof with a sky-high ceiling. 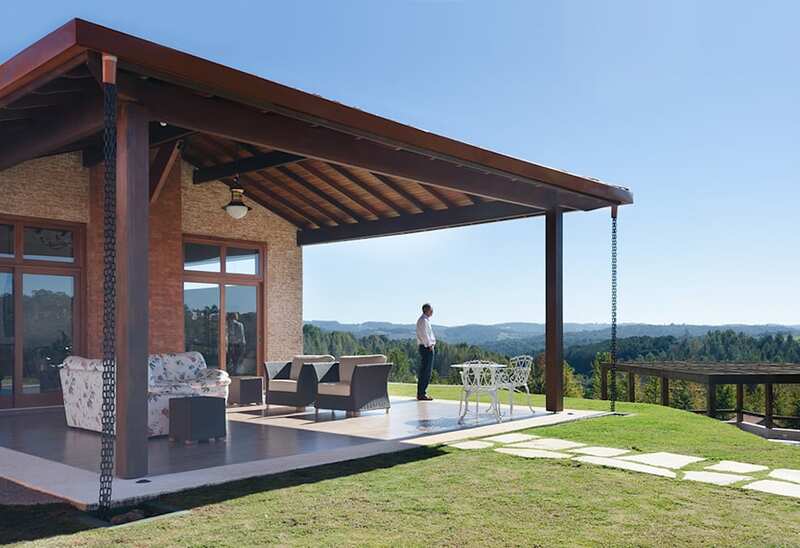 Solid beams add a warm and fabulous touch to make up a gazebo-like look. And for comfy relaxation we have some very cosy outdoor furniture, with fabric and rattan combining to produce an eclectic-meets-rustic feel. And who could overlook that breathtaking view? 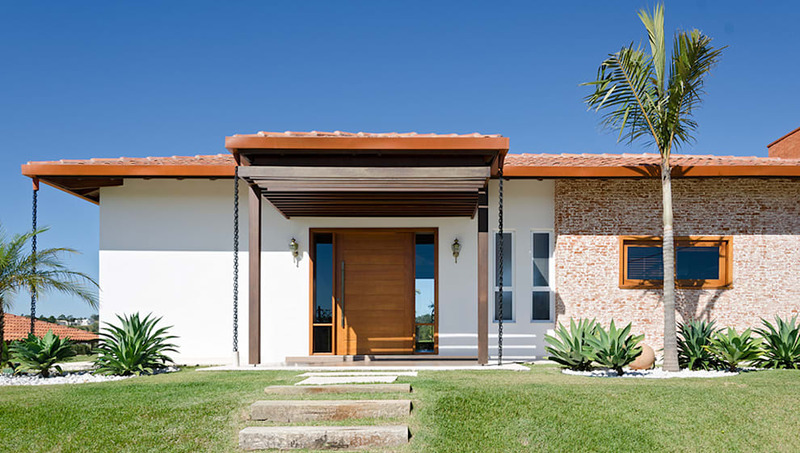 With a sun-kissed location such as here in Brazil, it would be a crime to commit to total shade anywhere, which is why the architecture does what it can to ensure a decadent dose of natural light for the interior spaces. 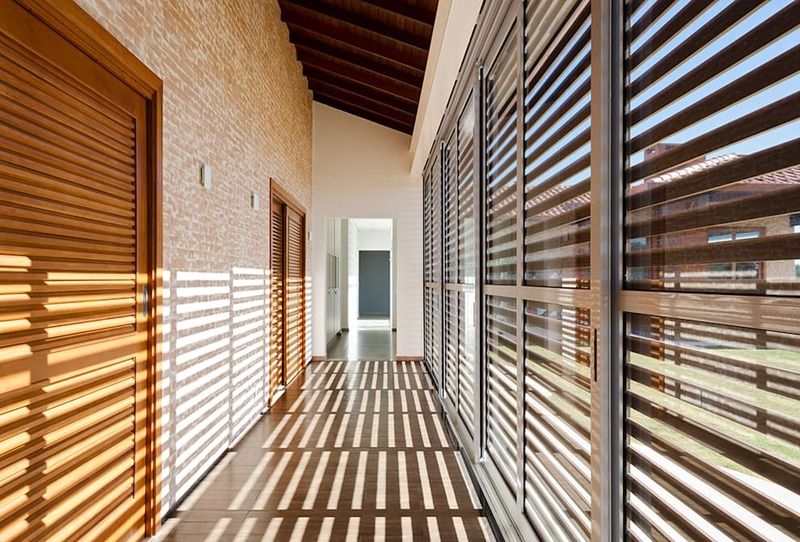 Slat-like screens adorn the windows and glass doors of the corridors, ensuring a healthy amount of both sunlight and shade. Notice how splendidly this interplay between light and shadow makes the earth tones of the brick wall come alive. Don’t think that we’ve forgotten about our mention about colour – it finally makes its appearance once we enter the culinary space. Blue Chill walls contrast most effectively with Spicy Red, while the ceiling pendants bring in purple, maroon, and gold. And don’t forget about the wall art which also brings in a pop of colour. A shiny black countertop meets up with the gleaming wooden platform, ensuring a dining-and-cooking space in one where the entire family can be together. Now, if this bathroom was situated in every house in the world, spas would run out of business very quickly. A lavish hot tub set in superior-quality wood ensures a most stylish resting place where we can soak up those bubbles in style. And the spacious shower with its crystal-clear glass panes ensures a most modern touch to the bathroom. But it’s the mosaic tiles that make this space work for us: arctic- and teal blues dream up a very deluxe ambience that immediately cools us off from the hot sun outside. 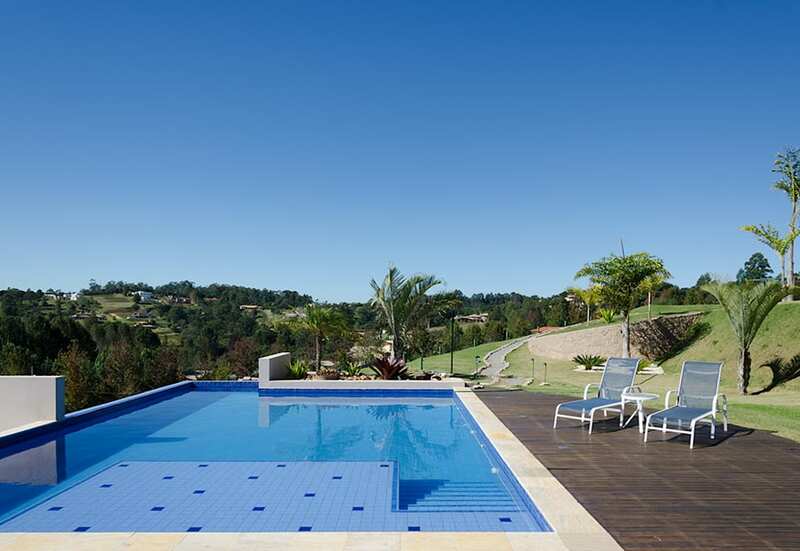 But we all know there’s only one way to truly beat the heat – a gorgeous swimming pool. Throw in a stylish wooden deck, fabulous loungers, and a backdrop landscape to rival just about any view, and you get this outdoor beauty right here! We just love how this villa remembers its cultural roots while experimenting with versatile décor ideas and modern clean lines. Need to cool off? Then see the: 7 Steps to Build a Pool in your Backyard.